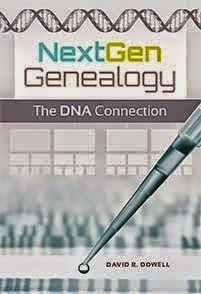 Several companies that test DNA for genealogical purposes are currently offering sales or will be by this weekend. 23andMe is currently offering 20% discounts on ADDITIONAL kits after the first when multiple kits are ordered at the same time. This sale is good for those who wish to test several family members. This is an atDNA test. AncestryDNA is offering a Mothers' Day Sale. It may be a little hard to find but clicking on the link in this paragraph should get you there. It is not clear how long the sale price of $89 will be available for this atDNA test. Buyers are told if they order before May 1st, the kit should be delivered by Mothers' Day. FTDNA is offering two separate sales for a tightly defined period. The sale begins at 12:01 AM CDT on DNA Day, Friday April 25th and ends on 11:59 PM on April 29th. Y-DNA SNPs will be 20% off from April 25 - 29. In addition, the Y-DNA 37 test will be 20% off the retail price. As usual with kits ordered from FTDNA, you may qualify for additional discounts by ordering through a surname or geographic project. Please note that there are two separate tests here. Because these two tests are aimed at different audiences, it is likely that one customer will not be ordering both at the same time. The yDNA 37 STR marker test is a good entry level test for men. It is to test the paternal line which usually corresponds with the surname. On the other hand the individual SNP tests are for more advanced testers who already have some idea about their deep ancestry haplogroup and want to define it more precisely. YSEQ is also offering individual SNP tests in direct competition with the sale of such tests at FTDNA. Again let me remind you that these tests are not generally for beginners to genetic genealogy testing. The price of $25 per marker "will be in effect until (including) Father's Day (June 15th 2014)." Thomas & and Astrid Krahn, formerly yDNA experts at FTDNA, are the principals in YSEQ. This price is cheaper per SNP than the sale price of FTDNA. Free shipping is offered on orders of 4 SNPs or more. Buyers will have to consider whether the cost and time of securing new saliva samples for YSEG will offset the difference in the SNP prices. For unusual SNPs one, both or neither lab may currently offer the desired test. There is no simple single solution that will be the best choice for everyone. So we have two sales for atDNA, two for yDNA SNPs and one for yDNA STRs. Have fun and enjoy the sales.